After reading His Dark Materials (Golden Compass), I was curious about Philip Pullman’s other works. 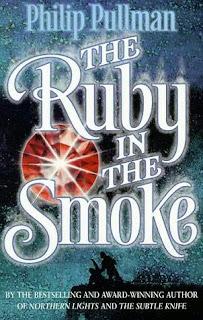 Sally Lockhart’s series seemed a good start to know this author a little better, so I decided to try Ruby in the Smoke. ‘Have you ever heard the phrase The Seven Blessings?’That question causes a man to die of shock, and propels Sally Lockhart into a desperate adventure that will expose the deepest secrets of the corrupt and murderous opium trade. Sally is sixteen when the story begins, orphaned and alone. She’s had an unconventional education: her knowledge of English Literature, French, History, Art and Music is non-existent, but she has a thorough grounding in military tactics, can run a business, ride like a Cossack and shoot straight with a pistol. When her father is drowned in suspicious circumstances in the South China Sea, Sally soon finds herself in terrible danger too – and at the rotten heart of it all lies the deadly secret of the ruby in the smoke. This is the story of 16 year old orphan, Sally Lockhart. After her father sudden death, she receives a strange message... Decided to unveiled the mystery, the young woman starts an adventure who will change her life. One of my problems with this book, is the main character – Sally. Many of her decisions and attitudes are not what we expect for a young woman of the late 19th century and she really felt terribly fake to me. Also, Sally is too perfect! No matter what, she always seems to find effortlessly a solution for everything and everyone's problems. Another particularity, in every dangerous situation she’s never really hurt or threatened. Unfortunately, her companions cannot say the same and they end up beaten and bloodied by Sally's enemies. No need to say how annoying it can be to read about such flawless and stagnant characters. The secondary characters were also a problem, since I barely noticed them. I was expecting so much from the photographer, Frederick and what a disappointment it was to see how he constantly stayed in the background just like the others. Even the villainess, Mrs. Holland, who, at first, sounded so promising, couldn't save the story. She ended up looking like just a rather silly old woman in quest of power. Even her ending is pathetic, making everything easy for Sally. I never really had the feeling I was reading a story set in Victorian England, but maybe Pullman wanted to keep things simple, since this is a young adult book. Everything happens very quickly which is sometimes confusing making it hard to keep your attention the story without being distracted by something else. I don’t think I’ll continue reading Sally Lockhart’s adventures. Oh, it's too bad you didn't like this book... I do think that the other two books in the trilogy are better than this first part. There's even a spin-off, The Tin Princess, but it definitely lags behind even Ruby in the Smoke. I thoroughly enjoyed this trilogy, but I agree it's not nearly at the level of His Dark Materials. Much more of a Victorian Nancy Drew type, though better written. Nothing in it to hint at the future brilliance of His Dark Materials. I enjoyed Clockwork much more, with it combination of folk tale and steampunk themes. I vaguely remember reading this in my youth...thanks for the reminder! It must not have impressed overmuch, because I haven't read any of the others in the Sally series. Alex, I haven't read any of Pullman's books, but I agree with what you've said here about unrealistic heroines (and heroes, for that matter). I recently read an interview with the late Western writer Elmer Kelton where he said that some Western authors wrote about heroes who were six feet tall and fearless. He preferred to write about those who were 5 foot 8 and nervous. A vulnerable heroine will get my heart every time over a crotch-kicking Amazon. Other people told me the exact same thing, that Ruby In The Smoke was the weaker story in this series and I should try the others. But I already know that my favorite character is going to disappear so I didn't see the point to continue. Did you read His Dark Materials? LOL I couldn't agree more with you. :) A heroine with flaws and fears is the way to win my heart too!